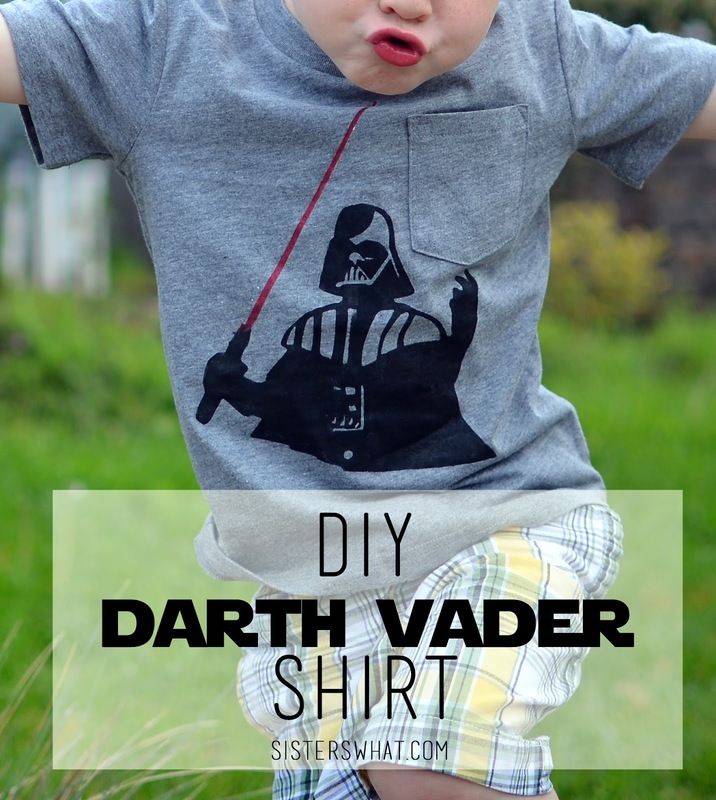 ' DIY Darth Vader Shirt - With a freezer paper stencil - Sisters, What! As has been mentioned before, I'm surrounded my boys who love Star Wars. My 4 year old the more outspoken fan (my husband loves it far more, but he doesn't talk and play Star Wars as nearly as much as 4 year old Captain Awesome does). In fact we're doing a Star Wars room for the two boys (did you see the Star Wars Light Switch I've already done?) and I'm kind of getting excited about some of the cool DIY art we're going do for it. Well, I keep pushing of doing any of it, but one of these days we'll make head way. But at least I finished putting together baby girls woodland themed room (I can't wait to share those pictures). Anyway, Captain Awesome been asking for a new Star Wars shirt ever since the husband one for his birthday, so finally during both little one's naps, I helped Captain Awesome make one. I did the classic freezer paper method by cutting out a Darth Vader Silhouette. Captain Awesome loves it! And yes, he is wearing pjs in the afternoon...I promise he was wearing normal clothes but changed as soon as he got home from preschool. Cut your stencil either with an exacto knife or silhouette machine. Make sure the image is on the freezer paper so that shiny part is on the underside of the stencil. After you cut it, you'll put the shiny side down on the shirt and iron it on. Paint your fabric paint on to the shirt. 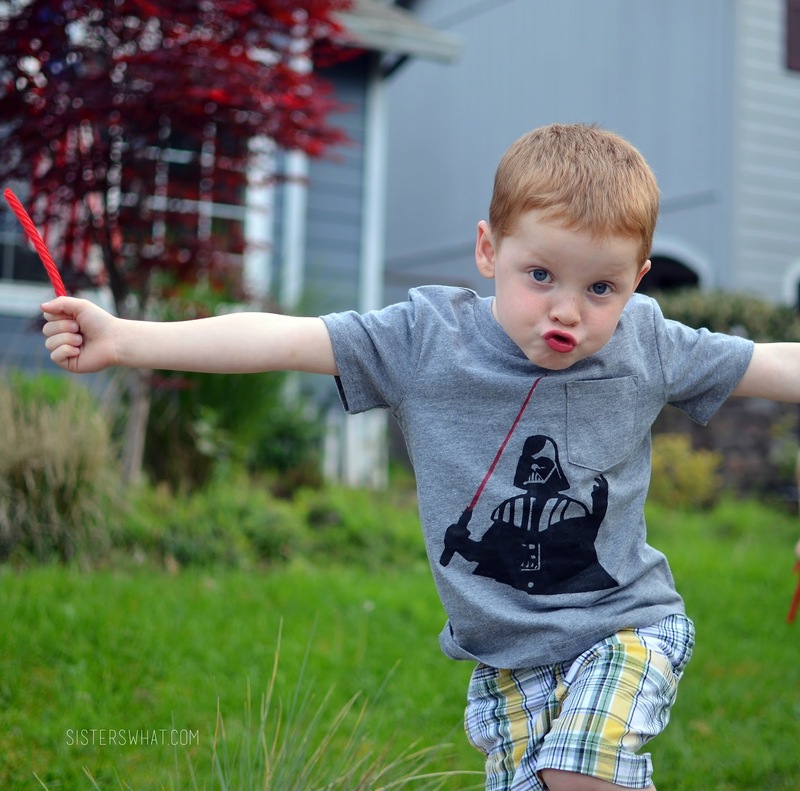 We did the light saber in red, but you could do all of Darth Vader in black. Let dry and wear immediately. 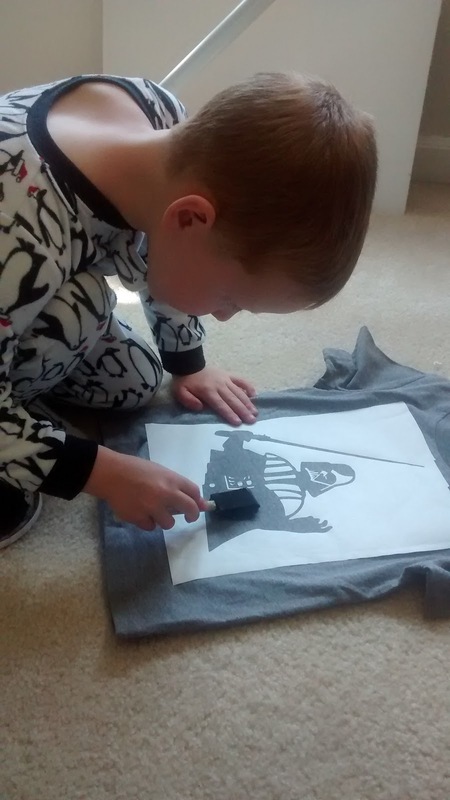 Your star wars DIY'S are too fun! I love how it turned out!